In the financial sector, reputation is everything. Businesses want to work with a lender that has a credible track record of success, and they look for evidence of this credibility in online reviews. LendingUSA provides financing solutions to businesses across industries, and had built up strong relationships with these businesses over the years. However, these businesses were not voicing their satisfaction online. In order for LendingUSA to present itself as a reputable lender and be chosen over competitors, the company would need to collect a significant number of reviews on respected sites like Google and Better Business Bureau. 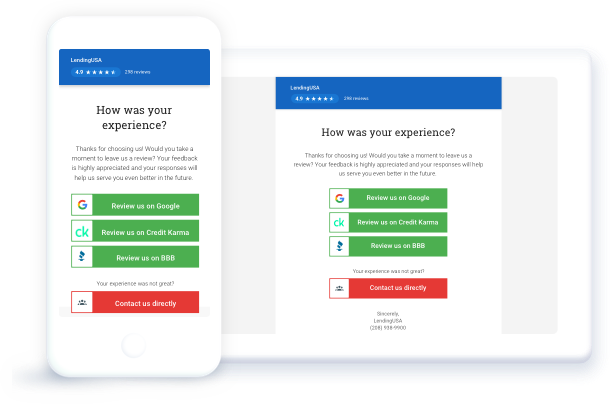 With BirdEye, LendingUSA began a series of systematic feedback collection campaigns. First, they launched Net Promoter Score (NPS) campaigns to identify their detractors, passives and promoters. Next, they segmented their contacts by sentiment so they could address them appropriately. Detractors and passives were contacted privately so their concerns could be addressed thoroughly before any negative feedback went public. Promoters (customers who left a rating of 9 or 10) were sent review request emails or SMS messages. These requests routed customers directly to sites like Google, CreditKarma and BBB where they could leave a review with minimal effort. Making the process easy for customers drastically increased conversion rate from request to review -- SMS requests yielded an impressive 32.3% conversion rate. BirdEye built a custom microsite for LendingUSA that displayed its best reviews from all sites along with up-to-date contact information and the ability for visitors to write a new review. A constant stream of new reviews provides fresh, organic content that search engines like Google prefer, so this review microsite ranked high in relevant search results. With BirdEye’s Goals feature, LendingUSA was able to set a target overall rating and constantly track how close they were to this target. LendingUSA monitored all its reviews from all sites in one place, and received automatic alerts from BirdEye whenever a new review was posted. They organized their reviews by business with automatic tagging and custom filters, making it easy to identify which businesses were performing well and why. They used these insights to educate their customers on best practices to set them up for success. 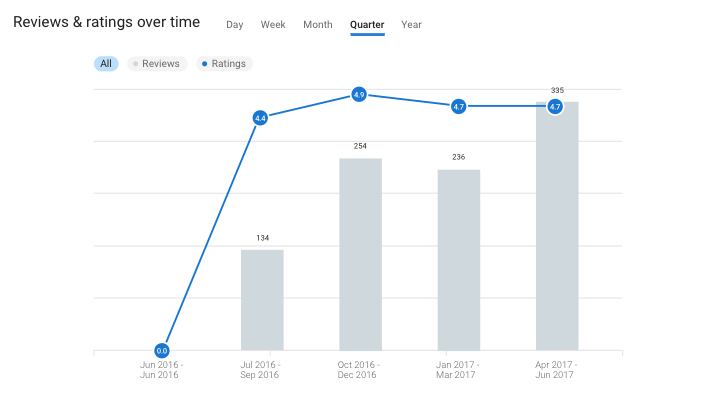 In their first year with BirdEye, Lending USA sent 158 campaigns to more than 31K contacts, generating 250x more Google reviews and 20x more reviews overall. These reviews earned them a 4.7, which is 27% higher than the industry average. 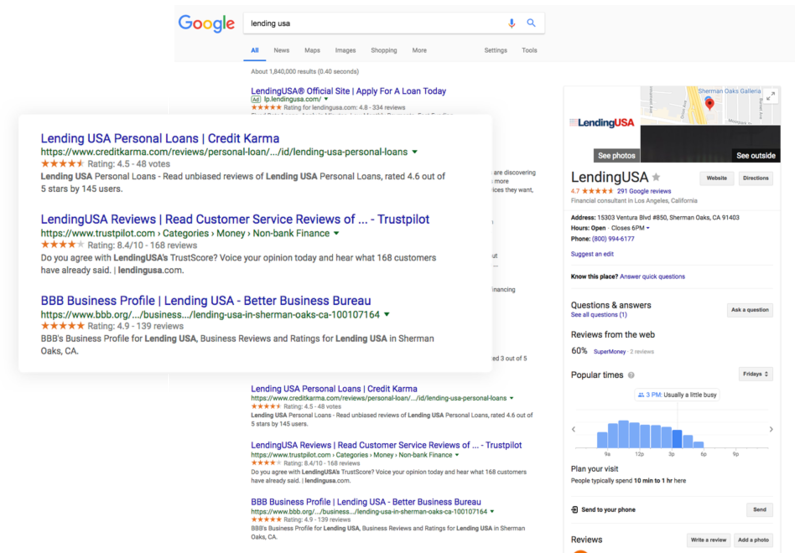 All their new positive reviews not only helped LendingUSA rank higher in organic search results -- they also outshine the competition with rich snippets that display star ratings beside their listings. 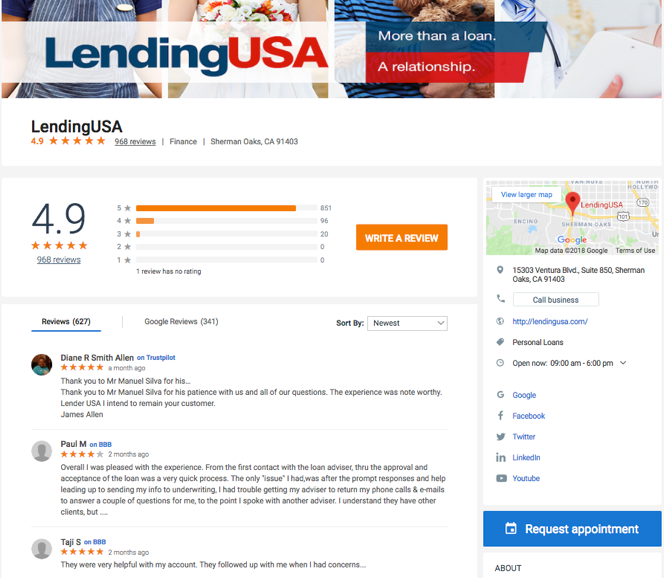 Their impressive collection of reviews, SEO improvements, and BirdEye microsite drove more than 95K visitors to LendingUSA’s website during the same time period. Now, when businesses search online for a trusted financial solutions provider, LendingUSA stands out as the clear leader. 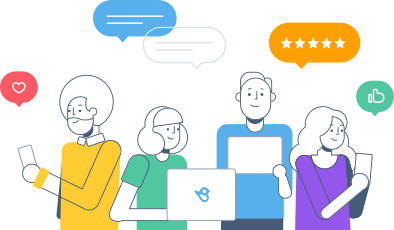 Get more reviews from your customers with BirdEye. Dominate search results. Beat local competitors. Grow your business. Easy, done.